Grease & Automatic Lubrication Systems Inspections: FLO Components offers lubricant audits and central auto greasing systems inspections – FLO Components – Automatic Lubrication Systems Specialist in Ontario and Manitoba. Many lubricants with each one specified for a specific application. Many different lubrication systems with dedicated repair parts inventory for each brand. Lubrication schedules may be known by your key lube technicians but there is no one single location where all the critical information is documented. The end result – a multitude of lubricants, systems, equipment and processes. HOW CAN YOU OBTAIN THESE SAVINGS? Review of all your lubricants, including where, when and on what pieces of equipment they are used. Review of key production machinery and existing systems. If there is no system installed, a review of all the lube points and lube requirements. If there is an existing automated greasing system, a complete review of all the documentation – layout drawings, service manuals for major components. Working with your key lubricators, we will review your processes, procedures and supporting documentation. With this information, you then have the ability to make informed decisions on potential changes in processes, products and applications. WHAT DO YOU GET FROM YOUR AUDIT? The audit uncovers a lack of maintenance of the customer’s currently installed automatic greasing system. The customer’s maintenance team does not have the time nor expertise to consistently address the issues. Upon the customer’s request, FLO’s trained service technicians, on a scheduled basis repair and up-grade the automatic greasing system while training the customer’s lube technicians on the system basics. Result – Minor items are caught and fixed before they become major problems. The client’s maintenance team’s time is focused on more cost-effective proactive activities. 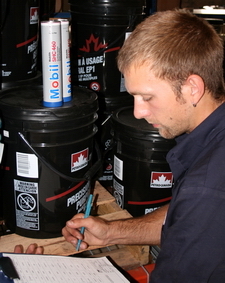 The audit discovers the customer is stocking multiple brands of the same type of lubricant. After reviewing all the applications, it is determined the customer can standardize on three types of grease. To ensure the right lubricant is used in the right application, grease gun barrels are replaced by clear ones. This allows the lube tech to see the colour of the lubricant which then matches the colour coding at the actual lube point. Results – On-going inventory costs are reduced due to product standardization. The right lube gets to the right point by colour coding the grease to the point. Contact us now to find out how small an investment is needed to start saving money and increase productivity.